Spell Bound Classic Slot Guide & Review - Casino Answers! 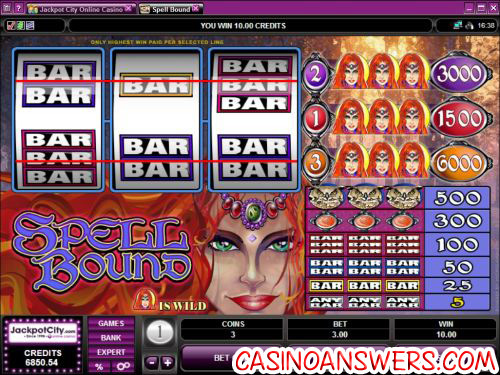 Spell Bound is a 3-reel, 3-line classic slot machine developed by Microgaming, featuring wild symbols. You can play the Spell Bound multi-line slot machine at 777 Dragon Casino and Jackpot City Casino. Bets on the Spell Bound slot machine are $0.25, $0.50, $1, $2 and $5. Hit “Bet One” once or twice followed by the “Spin” button to play 1 or 2 coins or hit “Bet Max” to play the maximum bet of 3-coins. Each coin represents a payline. Casino Answers recommends playing the maximum bet of 3-coins at all time in Spell Bound in order to be eligible for the top jackpot. The lowest total bet you can make on a spin in Spell Bound is $0.25. The highest total bet possible is $15 per spin. The highest paying symbol in Spell Bound is the Enchantress symbol. On the third line, 3 Enchantress symbols will pay out the 6000 coin top jackpot – a very good top jackpot for a reel slot machine. On other paylines, she will pay out 1500 and 3000 coins. The Enchantress symbol is wild and will substitute for all symbols on the Spell Bound slot machine. Try and hit 3 Enchantress symbols when playing Spell Bound for real money at 777 Dragon Casino! There are 7 winning combinations on the Spellbound slot game. The full payout schedule is as follows (1/2/3 line payouts listed when applicable): any 3 Bar symbols (5), 3 Single Bar symbols (25), 3 Double Bar symbols (50), 3 Triple Bar symbols (100), 3 Medallion symbols (300), 3 Owl symbols (500), 3 Enchantress symbols (1500/3000/6000). Switch Spell Bound over to Expert mode to gain access to its autoplay feature. You can play 5 or 10 autoplay spins with no advanced settings or you can hit “Autoplay” to open up the advanced settings. You can play 5, 10, 25, 50, 100, 250 or 500 autoplay spins, set the number of seconds between spins to 0, 0.25, 0.50, 0.80 or 1.50. Stop settings available are: stop once all spins are complete, stop when jackpot is won, stop if a win exceeds or equals ($25, $50, $100, $250, $500, $1000 or $2500), stop on any win and stop if credits increase/decrease by ($25, $50, $100, $250, $500, $1000 or $2500). You can stop the autoplay feature on Spell Bound at any time. For a great online casino to play the Spell Bound 3-line slot machine at, you can try it out for free with $777 in free bets at 777 Dragon Casino! Can I play the Spell Bound slot game at a US-friendly casino for real money? Unfortunately, only Microgaming online casinos have the Spell Bound slot machine available and they are not accepting players from the United States of America at this time. For a great selection of slot machine, please check out the US-friendly Super Slots Casino. Is a free Flash game of the Spell Bound slot available to play? Yes, you can find the No-Download Instant Play Flash version of Spellbound at 777 Dragon Flash Casino and Jackpot City Flash Casino. You can play in practice mode for free or for real money. If you experience problems with the Flash casino software, try downloading the latest version of Flash Player.